Mercedes-Benz kept the U.S. luxury sales crown for the third year in a row in 2018, beating rival BMW by just under 5,000 vehicles. Mercedes sales were down 6.3 percent to 315,959, while BMW reported a rise of 1.7 percent to 311,014. Lexus volume dropped 2.2 percent to 298,310 and Audi deliveries fell 1.4 percent to 223,323. Tesla sold 182,400 cars, up from 48,000 the year before. Overall, U.S. luxury sales fell 0.3 percent to 2 million vehicles, even as overall industry volume edged up 0.6 percent. Acura leapfrogged Cadillac, selling 158,934 vehicles and topping Cadillac by 4,232 units. Among other luxury brands, U.S. sales in 2018 rose at Land Rover, Porsche, Alfa Romeo, Acura and Volvo but slipped at Jaguar, Infiniti, Genesis and Cadillac. "Luxury will remain as hot as ever in 2019, with a slew of new product and new segment entries," said Akshay Anand, executive analyst at Kelley Blue Book. "The sales crown may mean a lot to automakers, but to consumers, what matters is finding the best bang for their buck in a time when most vehicles out there are rock-solid." BMW, however, bested its chief German rival in December — with sales of 34,357. Mercedes, meanwhile, sold 32,016 vehicles, excluding commercial vans. Lexus' U.S. sales in December dipped 0.2 percent to 35,524. Audi's deliveries tumbled 16 percent to 22,765 units. Mercedes' volume leaders in December included the GLC, C-class and E-class model lines. The GLC took the lead with sales of 7,294, followed by C-class sales of 6,799. The E class rounded out the top three with 5,042 units sold. 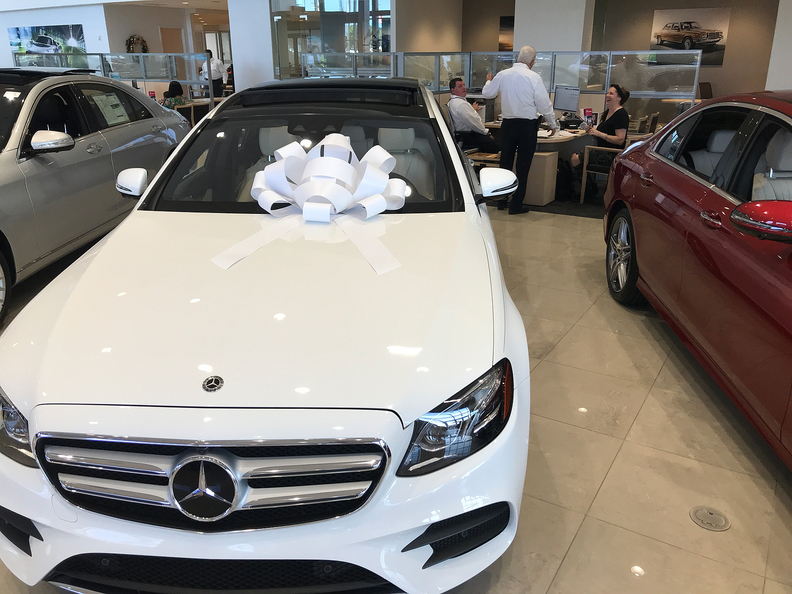 "Despite the delayed availability of some of our most popular models in 2018, we achieved a solid closing of the year thanks to the excellent work of our dealers," Dietmar Exler, CEO of Mercedes-Benz USA, said in a statement. "With the youngest and most comprehensive lineup in the luxury segment, we will continue to advance our position in the marketplace." Crossovers accounted for 63 percent of BMW's U.S. sales last month. For the tenth consecutive month, the BMW X3 was the top-selling BMW model in the U.S., followed by the new BMW X5. The BMW X3 and X5, combined, represented more than two out of every 5 BMW vehicles sold in the U.S. in December. Sales of electric vehicles and plug-in hybrids totaled 2,774 in December, up 2 percent from a year ago. Porsche Cars North America reported December U.S. sales of 4,086 vehicles, a 4.4 percent uptick from the same time last year. Retail sales for 2018 climbed 3.2 percent to 57,202. It was the seventh consecutive record year of growth for Porsche. The Macan led the pack with more than 23,504 deliveries in 2018, up 9.7 percent. Panamera sales rose 19 percent to 8,042 units. Meanwhile. Porsche 911 sales accelerated 7.6 percent to 9,647 units, helped by strong demand for GT models. "A record 2018 is an excellent starting point for an even more dynamic 2019, when highlights will include the market entry of the next-generation 911, the updated Macan, and the launch of our first all-electric sports car, the Taycan, late in the year," Porsche Cars North America CEO Klaus Zellmer said in a statement. Overall, luxury sales dipped 0.4 percent to 217,338 cars and light trucks in December.